Bonhams raised the ever-popular barn find stakes at classic car auctions to a more classy “castle find” for the Spa Classic Sale in May 2017. A collection of twelve classic motorcars that were discovered at a Swiss castle will be sold without reserve at the classic car sale held at the Spa Francorchamps racing circuit in Belgium. The two highlights from this collection are a 1958 Mercedes-Benz 300SL Roadster and a 1921 Rolls-Royce 40/50hp Silver Ghost Double Phaëton – both cars enter the auction with a come-buy-me estimate of €600,000-800,000 ($648,000-865,000). Bonhams will hold its Spa Classic sale on 21 May 2017 at the legendary Francorchamps circuit in Belgium. Early highlights announced for the Spa sale include a collection of 12 classic motorcars that has been unearthed in a Swiss Schloss and will be offered, all without reserve. This continue the recent fad of including “collections” at classic car auctions and “Swiss” never hurts when mentioned with car. 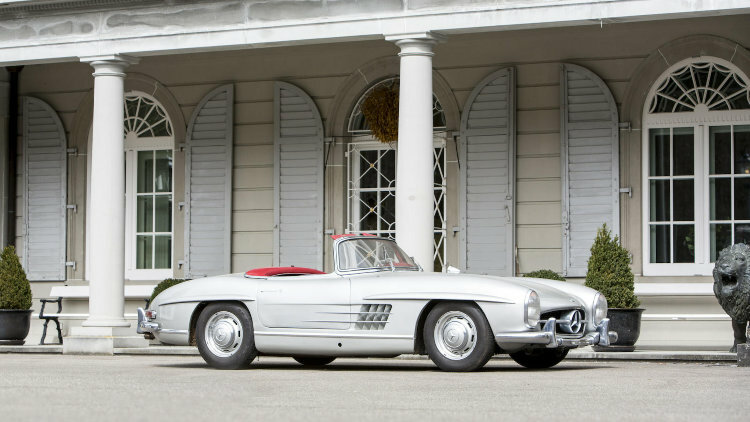 Amongst the 12-strong collection are examples of some of the world’s most iconic classic models, including a 1958 Mercedes-Benz 300 SL Roadster (€600,000-800,000). The model celebrates its 60th anniversary in 2017, and remains arguably one of the most influential post-war sports cars ever created. It was originally developed as a road-going version of Mercedes’ hugely successful W194 racing car. Losing the ‘gullwing’ doors allowed the roadster to develop in to a truly driveable supercar with improved handling, access and suspension. No further details have yet been released on the originality of this Mercedes Benz but photos show a car seemingly in good condition – clapped out versions have sold for well above the mentioned estimate. Although 300SL prices have been weaker in the past year or two, a roadster rarely achieve much below a million dollar at auction. Another legend of the motoring world is a 1921 Rolls-Royce 40/50hp Silver Ghost Double Phaëton (€600,000-800,000). Proclaimed by Autocar in the early 20th century as ‘the best car in the world,’ it is the last word in motoring luxury and perhaps the most influential automobile from the early days of motoring. Whisper-quiet yet capable of long-distance touring, the Silver Ghost is a feat of British engineering which remains a highly sought-after addition to any serious motor car collection. A 1934 Rolls-Royce Phantom II (€80,000-120,000) was also uncovered, the last of the marque’s 40/50hp models. Essentially a refinement of the Phantom I, several improvements were made to the model such as a brand new chassis design and added synchromesh on the high gears for a smoother driving experience. Described by Ferruccio Lamborghini as ‘my Rolls-Royce; still quite fast but also large and comfortable,’ the four-seater GT Espada (€70,0000-100,000) is as close to a family-friendly supercar as you can get without compromising on the evilish design the Italian marque is so renowned for. Designed by Gandini at Bertone, the Espada was the most successful Lamborghini model until Countach production was expanded in the mid 80s, and with a top speed of 155 mph, it was, at the time of production, the fastest four-passenger motorcar in the world. Two 4.9-Litre Maseratis were also uncovered from the Swiss schloss: an Indy America (€50,000-80,000) and a Ghibli SS (€100,000-150,000). The latter is the fastest road car ever produced by Maserati, capable of an astonishing 174mph (280 km/h). Characterised by its low ‘shark-nose,’ it was designed by Giorgetto Giugiaro towards the beginning of his career whilst he was still at Ghia, and his cunning inclusion of two bare-boned cushioned cutouts in the rear allowed the car to be marketed as a 2-door 2+2 coupé. The Aston Martin V8 first appeared in 1970, and the DBS V8 was met with such success that a convertible model was always considered. The marque was initially concerned about building such a high-powered convertible, but in 1978 they eventually saw the light and created what became the most successful Aston Martin ever, enjoying a record-breaking production run with 2,919 cars sold. The 1980 Aston Martin Volante (€90,000-140,000) manual transmission version is the ultimate in soft-top luxury with a 150mph top speed, it ranked among the world’s fastest convertibles at the time. Described by former Aston Martin Chairman Victor Guantlett as ‘a stylish thoroughbred, beautifully built, luxurious, fast and immensely safe,’ what’s not to love? A further highlight announced for the Bonhams Spa 2017 sale is the 1991 Benetton B-191-02 Formula 1 car driven to victory at the Canadian Grand Prix in 1991 by Nelson Piquet and raced by Michael Schumacher at the final two races of the season.